I can’t believe I am JUST now getting around to blogging our trip out west this past summer! We went out to California because my husband was speaking at a camp there, as well as one in Washington. In between the two camps, we drove from Redding, CA to Los Angeles to Spokane Washington to Seattle. We put over 3,000 miles on our rental car (whoops) and got see such a huge part of the west coast. We stumbled upon some amazing little towns, beaches & restaurants. So, I figured I would share some of my favorite places we went this past summer (west coast & beyond) for any of y’all who might be taking a little road trip soon! Narrative Coffee in Everett, WA. This is one of our favorite coffee shops of all time. SO dang good and if you’re ever near Seattle, you have to stop in. States Coffee in Martinez, CA. Cute little coffee shop in a tiny little town outside of San Francisco. Theory Collaborative in Redding, CA. I didn’t take any photos in this coffee shop, but we went as soon as we got to Redding & it was the best first stop! It is run by people at Bethel Church and is a wonderful place, with some great food too! Black Crow Coffee in St. Petersburg, FL. I absolutely LOVE this coffee shop. Its so eclectic and has about 102 plants inside, a ton of cool art work, and antique decorations that make it so cozy and fun. Life Ring at Oyster Rock in Calabash, NC. I am not kidding, this is one of THE best desserts i’ve ever had. 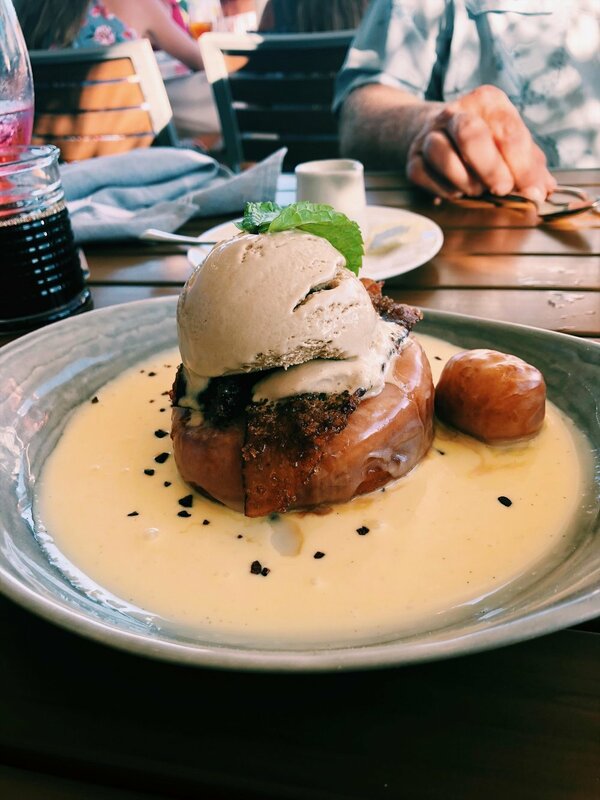 Its a glazed doughnut topped with candied bacon & coffee ice cream. Gosh, just thinking about it makes my mouth water. SO good! Salt & Straw in Portland, OR. What a crazy ice cream shop. They have some of the weirdest flavors and sound like they wouldn’t be good, but surprisingly are. We got honey lavender, coffee & chocolate, strawberry honey balsamic with black pepper & salted caramel with caramel ribbons. Some of the best ice cream I’ve ever had. Whidbey Pie Cafe in Whidbey Island, WA. This is the cutest pie shop right on the water. Whidbey Island is right off Seattle, very close to Canada. Its a HUGE island that is unbelievably beautiful, plus it has amazing pie. So win-win. Kollar Chocolates in Yountville, CA. This is a little wine town, literally in the middle of major vineyards right outside of Napa. This is where the famous French Laundry restaurant is, as well as the Bouchon Bakery. Their chocolates look fake & inedible. Truly artwork, but they also taste amazing. Yack on 5 near Redding, CA. One of our friend’s suggested this place to us as we were heading Spokane. Its in the middle of nowhere California, right off the highway. From the outside, it looks unimpressive. But probably one of the best burgers Ive ever had was there. PLUS they have these sticky bun things that will change your life. Solstice Wood Fire Pizza in Hood River, WA. We drove over to Hood River one afternoon to grab lunch and we were SO glad someone recommend this place to us. We got to sit outside, look at the river across the road, and eat some dang good pizza. Can’t get much better than that. Casita Taquiera in St Petersburg ,FL. Yum yum yum. This place is GOOD, fast, and affordable. Such a cute little Mexican spot in St Pete. Flying Goat in Spokane, WA. A girl who used to live in Spokane said this was her favorite pizza place ever. So naturally, we went. It was so good that we ordered one pizza and then after eating it, ordered another one. So, I’d definitely recommend it! Karma Juice Bar in St Petersburg, FL. Im glad I don’t live in St Pete, because I would go here everyday and have no money. Tons of healthy food options, amazing smoothie bowls, and a really cool atmosphere.